Too often we travel by plane. It is fast, but we miss the transitions that connect one place to another. The ride from Dubrovnik to Montenegro was all about transition. We began in decent weather and passed into storms as we drove through "no mans land" - and area spanning the border between Croatia and Montenegro. 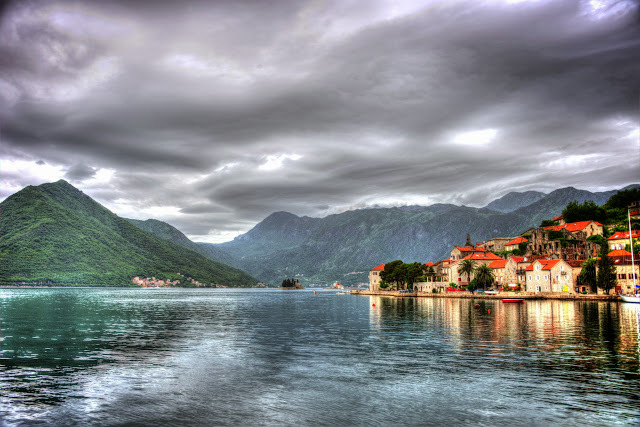 The coast line changes in Montenegro to the largest Mediterranean fjords in the world. The black mountains rise out of the dark emerald waters, and small villages and roads delicately hug the coastline. It is incredible that this is coastline at all. With the storms and lack of open water, it is an easy point to forget. We hit Perast on our way to Budva, a city on the Montenegro riviera. Incredible! This blog looks exactly like my old one! It's on a completely different subject but it has pretty much the same layout and design. Wonderful choice of colors!